Could your business prosper with reduced subsidies? 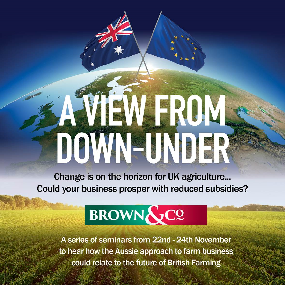 A series of seminars from 22nd - 24th November to hear how the Aussie approach to farm business could relate to the future of British Farming. David Heinjus is the award winning Managing Director of a successful Agri Business Consultancy business operating in South Australia and New South Wales delivering advice to the whole spectrum of Australian agri businesses. As well as sitting on various advisory boards, benchmarking Groups, delivering training and lecturing at Agricultural Colleges, David also runs his own 3600ha in hand business. David will share his experience of agri business operating in an industry with some of lowest levels of support in the developed world and highlight the key factors that lead to sustainability with lower levels of support.